After 8 minutes of cooking, the timer goes off, I open the oven to turn the pan around and I’m greeted with smoke. And lots of it. The smoke detectors immediately go off, my dog starts howling, and my husband practically falls down the stairs trying to get to it to shut it off. By then, all of our smoke detectors through out the house are going off (they’re all hardwired into the house and together). Okay. Back to the drawing board. I cranked my heat back to 275-degrees from the 350 the recipe says. Then stood there by the stove for the second batch, turning the tray every 4 minutes for a total of 16 minutes. Perfect. But the burned ones still taste pretty good. Mix cinnamon and sugar in a shaker or bowl. 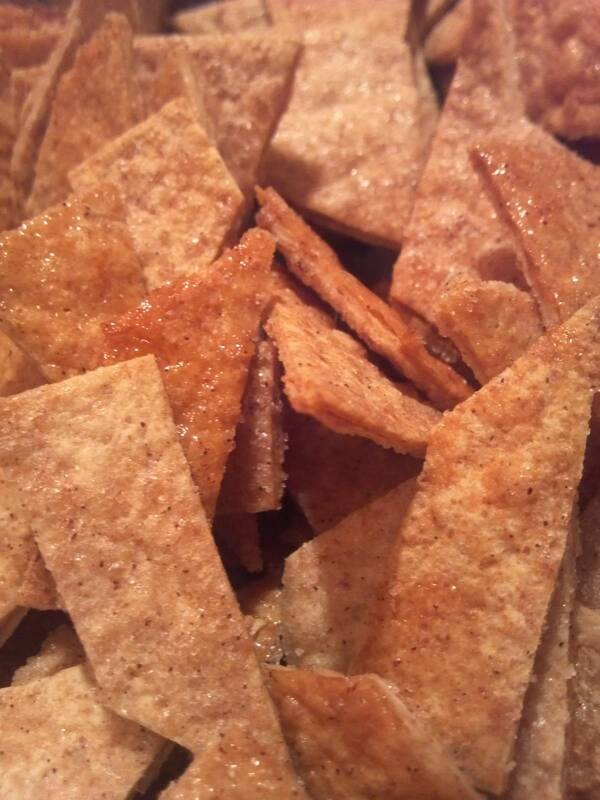 Lightly brush butter on both sides of tortillas, and sprinkle sugar on both sides. Using a large kitchen knife (chef’s knife is easiest), cut tortillas into 8 wedges and place them on a parchment lined baking sheet. Use 2 separate cookie/baking sheets. Bake 10-12 minutes, until brown and crisp.